Italian brand Ex.t have been known to think outside of the box when it comes to bathroom products and they’ve confirmed it again with three new products that they’re launching at Maison&Objet. 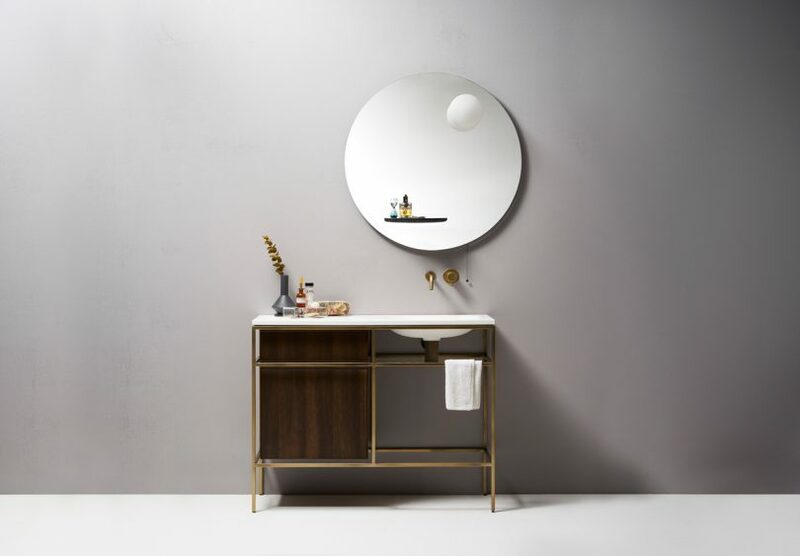 Working with Samuel Wilkinson and Norm Architects, Ex.t is expanding their bathroom designs to include two new mirrors and a sink console that could completely transform any bathroom space. London-based designer Samuel Wilkinson designed two new mirrors that are inspired by outer space and the force of gravity. First up is Float, a mirror with an opal glass sphere that “floats” on the mirror alongside a semi-circular marble shelf. Also designed by Wilkinson, Gravity is made from framed double mirrors that are attracted to each other due to magnifying forces. Frame, designed by Norm Architects, explores a new type of sink cabinet. The Frame System originally launched last year but for 2017, they’re presenting it with brass finishes, a smoked oak wood, and Navona travertine, which were handpicked by Norm Architects. The material choices bring a sense of warmth to the collection and its lightweight body allows changing it out should you want a different look of if you’re moving and want to take it with you.